EBSCO Academic Search Complete ve Ulakbim TR Dizin tarafından taranan Uluslararası İlahiyat Alan Dergisi Kader'in 31 Aralık 2018 tarihinde yayınlanacak 16. cilt 2. sayısı için 15 Ekim 2018'e kadar makale kabul edilecektir. 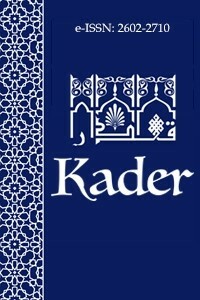 The publication dates of our journal have been updated as June and December for the purpose of making the publication period of journal more relevant to the academic processes, in accordance with the decision taken at the meeting of Kader editors. The last article acceptance date for our December issue is November 15, 2017. Submissions after this date will be taken into consideration for the issue of June 2018.